If there’s one takeaway from Modex 2016 that will stick with us it’s that the supply chain industry is evolving at a rapid pace. From automated material handling to software that harnesses and makes sense of big data to safer and more ergonomic products, the show was rife with innovation. While the technology is improving, most companies are facing challenges in another critical aspect: Hiring skilled workers. As the workforce ages and veteran employees look to retire, companies are struggling to fill positions. We’ve written about the manufacturing skills gap before and it was a topic that came up repeatedly in our conversations with industry colleagues at Modex. After all, the Manufacturing Institute research shows that by 2025 the skills gap will result in 2 million unfilled jobs. It’s a great concern across the industry. However, we were encouraged to hear of the efforts organizations are making to engage a new generation of the workforce as well as increase programs and training opportunities for specialized industry skills. 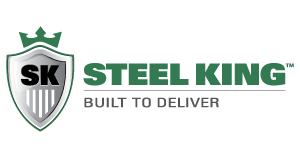 Steel King, a manufacturer of pallet racks, portable racks and guardrails based in Wisconsin, was struggling to hire and retain skilled welders. To address the issue directly, the organization developed an in-house welding certification program. Steel King is also coming at the skills gap from another angle by educating young adults and their parents. And the reason is this: A Deloitte study found that only 1 in 3 parents would encourage their children to pursue a career in manufacturing. One of the critical skills needed in the industry is welding; SteelKing has implemented internal and external programs to address this issue. “We are partnering with local high schools, technical schools, universities to help us develop our own internal training program. We also go to any local career days being held at local high schools to talk to students about what a career in welding could do for them,” says Glenn Thiede, VP of Manufacturing at Steel King. It takes time and energy to invest in these types of programs, Thiede says, but finding new ways to attract, grow, and retain new welding talent is essential for the future health of Steel King, and the industry as a whole. The Material Handling Equipment Distributors Association (MHEDA) is a trade association dedicated solely to improving the proficiency of the material handling equipment distributor. One of its critical impact factors for its membership is to “create a culture that blends generational differences.” Liz Richards, CEO of MHEDA, says it’s something the organization has been working on for several years. As an example, she says there is research showing millennials are looking to work in an organization that’s not just about profits, they are looking for a company that understands the importance of corporate consciousness, social responsibility and community mindedness. “And not only is that good for the millennials, but their stakeholders, their customer base, they’ll create more loyalty that way,” Richards says. MHEDA is also involved in educational programs to recruit the next generation of industry leaders. At Modex 2016, they co-sponsored a connection summit where students were invited to the show. About 250 students from various universities from around the country took part in the program. The students, all of whom are studying curriculum related to the industry, are broken down into groups each led by MHEDA board members. They spend a few hours visiting different booths and learning about the companies. Later, they take part in seminars designed to help them on their career paths. A second day is devoted to on-site tours of local facilities. “It’s a great networking opportunity and a way to make connections within the industry,” says Richards. As a company that’s focused heavily on engineering, Hytrol is challenged with not only recruiting professionals with the right skills, but retaining those high-value professional level employees. “We have engineers that are retiring or moving. Of course, the generation today, there’s a lot more talent that moves,” says Boyce Bonham, Director of Integrated Systems and Controls at Hytrol, a leader in the design and manufacturing of advanced conveyor systems. As a result, Hytrol has implemented programs to attract homegrown talent. Located in the same town as Arkansas State University (Jonesboro, Arkansas), Hytrol has developed a strong relationship with the engineering program at the school. Another aspect of bringing on new hires is the time – and investment – it takes to get employees acquainted with all the systems, programs and people at the company and start contributing in a meaningful way, Bonham says. The program has been a great success and Bonham says they are looking at expanding the apprentice model to other departments within Hytrol. Retaining talent and allowing employees to grow within the company is also important to the organization, Bonham says. To that end, they have training programs to support those people who want to be the future leaders in the business. “If they want to move up into supervisory positions of some kind, they can go take a class on that. We know it’s not just important to bring people working at the engineer level or the training level or purchasing level, but we need to be developing the future leaders in those areas as well,” Boyce says. UNEX, which manufactures carton flow and conveyor equipment is also working with local colleges and organizations to develop specialized programs for key positions and skills within their own company and other manufacturers. As we heard from other manufacturers, finding the right fit for both the skills and company is critical to keeping employees long term. Brian Neuwirth, President of UNEX, an order picking and carton flow solutions, realized recently they needed to bring in workers in its fabrication area. They had several veteran employees that were moving toward retirement and wanted to leverage their extensive knowledge to train new employees. “Our senior people trained eight new recruits on our machines, we evaluated their performance, and ended up keeping four of them. Now these employees will take over as employees retire,” says Neuwirth, adding having an internal plan to seamlessly transition key roles as members of the workforce retires is vital to ensuring continuity and consistency. Outside of the organization, Neuwirth is involved in several groups on an industry level (for example, he serves on the board of MHI) and at the state level (i.e. New Jersey Business and Industry Association) where he works with legislators and other key officials on workforce development issues. One of the issues he’s noticed is people do understand the manufacturing skills gap is a problem – today and well into the future – and many governmental entities are making efforts to address the issue. However, it isn’t being addressed in a strategic and holistic way. “A lot of people, from a state perspective and a federal perspective, have funding available but all of these areas are silos, individual silos and nobody’s connecting the dots,” Neuwirth says. Working with other organizations to develop a broader plan and understanding, as well as working with other companies to identify specific skill sets where there will be vacancies in the coming years is a key step to proactively address the talent gap, Neuwirth explains. Then, working within existing educational networks, programs tailored to specific skill sets can be developed and implemented. There’s no doubt the manufacturing skills gap is one of the greatest challenges facing our industry. But, it’s a challenge we can overcome; there’s opportunity for innovation, cooperation and a chance to bring new perspective into the space. It was eye-opening to get a glimpse into how companies and organizations are tackling it within their organizations and on a broader industry level. It made us that much more positive on the future of manufacturing. What are you and your organization doing to address the manufacturing skills gap? We’d love to hear! Find us on Twitter @CiscoEagle.